Implant surgery can be done in a dental office. A local or general anesthetic may be used. 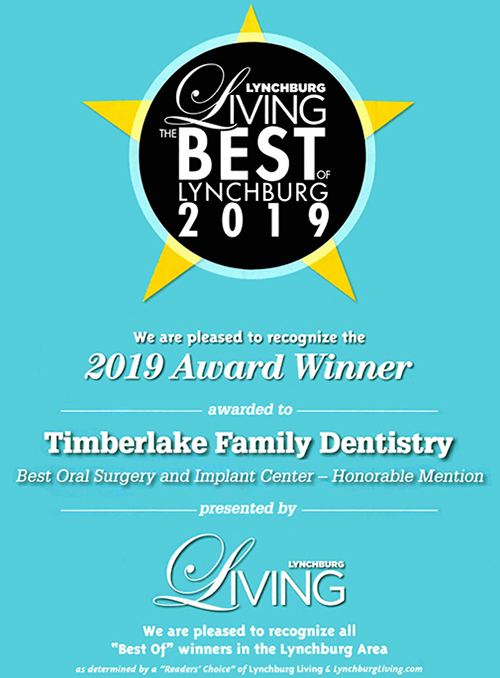 Our team at Timberlake Family Dentistry will give you instructions on diet and oral hygiene. First Dr. Smith will numb the area, and use a special drill to create the space for the screws. Typically six mini-implants are inserted in these holes and tightened to serve as anchors. Your denture will be retrofitted with a metal housing for each post so that the denture can snap into place. Now that the denture is anchored, it cannot slip or move, and makes the denture-wearing experience much easier. The procedure causes little discomfort and requires almost no recovery time, so many patients are able to eat dinner that same day.